Is there such a thing as too much bling? (oohh, that was awesome, I just Dr Seussed the sh!t out of that sentence) Well, in case you didn't know the answer, it is - no, you can never have too much bling. Take this next mani for example. 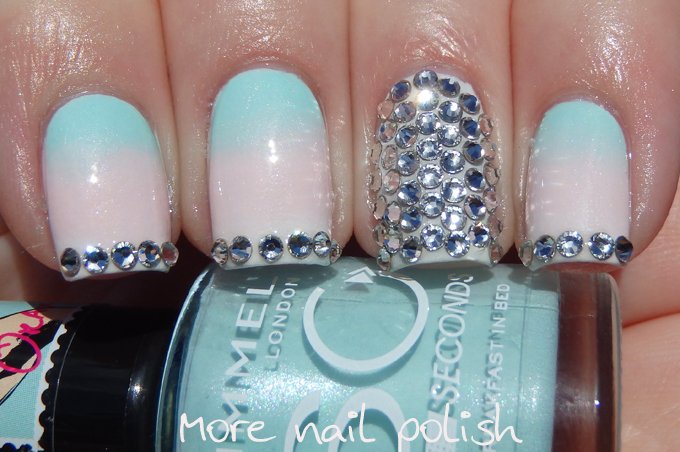 Beautiful soft pastel gradient, combined with retina searing Swarovski bling! No need for photo effects to create rainbow flares, these crystals do it themselves. 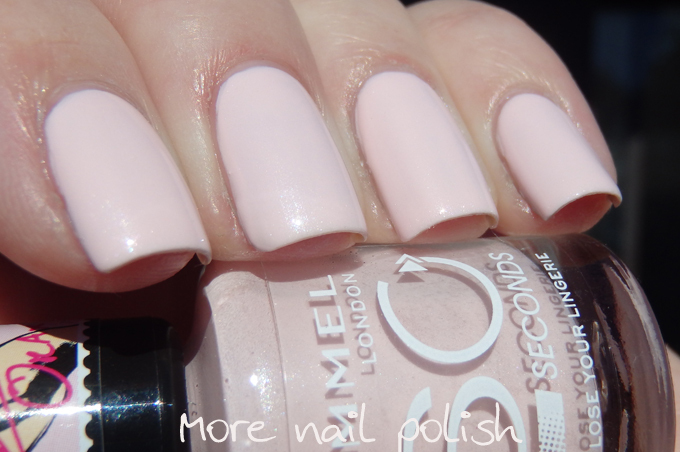 I created the gradient using the three pastel shades in the new Rimmel London Rita Ora collection. On my ring finger I placed 44 SS05 sized silver Swarovski crystals. I also placed a row along each french tip. The reflections off these were like a mirror ball! Now lets look at each of these shades individually. Each one has a great formula and is perfectly opaque at two coats, including the white. They also all have a very fine white/silver shimmer which gives them a wet or glass like appearance. I can see me using these a lot as the base for nail art. Breakfast in bed - Pastel blue creme with a soft silver white shimmer. Lose Your Lingerie - Pastel pink creme with a soft silver white shimmer. 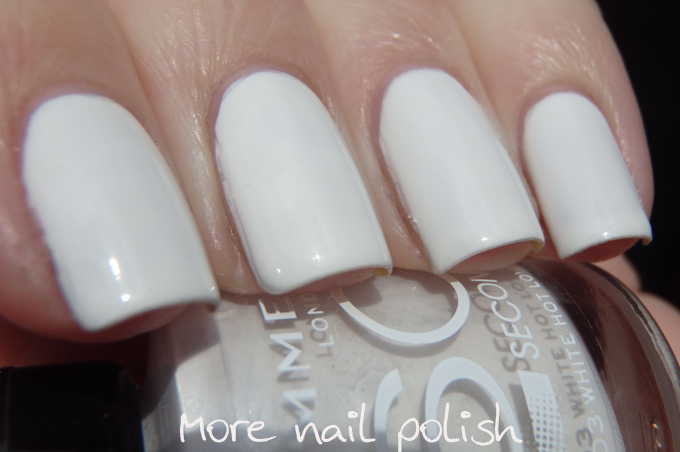 White hot love - bright white creme with a soft silver white shimmer. The Rita Ora Collection by Rimmel London are available from this month from Priceline, Priceline Pharmacy, Target, Kmart, BigW, selected pharmacies and selected Coles and Woolworths. For stockists call 1800 812 663. This is so pretty and I'm loving the bling! So cool! I love ombre! Wow! 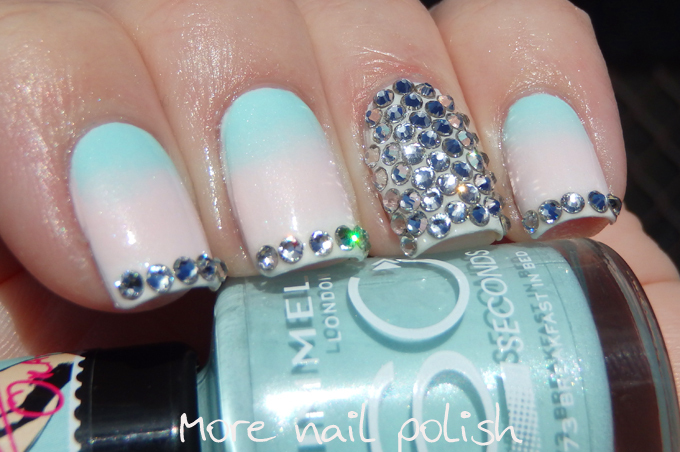 Beautiful gradient and crystals look gorgeous! !